Saab has just announced that the 2008 Turbo X — the new range-topping version of their 9-3 sedan — will start at $54,995 — just shy of 55,000 loonies. Do the math and that's $53,898 in real money, $11,388 (USD) more than the car will start at south of the Windsor-Detroit line. Yet vehicle sales in Canada remain strong, despite continuing price disparities and in contrast to US sales, which are on the decline. Report on Business reports that while US auto sales are projected to fall to 14.9 million this year - the lowest level since 1997 and down from 16.1 million last year - Canadian sales are projected to hit 1.645 million, only a slight decrease from last year's 1.653. The strong market there is being credited to strong job creation. The paper goes on to report that vehicle prices in Canada have fallen about 5% so far this year, due in part to widespread publicity about vehicle price disparities between the two countries. This despite the stabilizing exchange rate between the two currencies during the same time period. But this correction only goes a small way to addressing the higher prices Canadians are asked to pay for vehicles, which, as evidenced here, are often 20% more than their US equivalent. Oshawa, Ontario (April 9, 2008) - General Motors of Canada today announced pricing on the new, limited edition 2008 Saab Turbo X 9-3 variant. The all-black Turbo X takes Saab "back to the future," evoking the iconic appeal of the first black 99 and 900 Turbos while introducing Saab's cutting-edge "cross wheel drive" (XWD) technology, with pricing starting at $54,995 for the Sport Sedan version and $56,305 for the SportCombi. Saab's advanced new XWD system is also available as an option on 2008 9-3 Aero models, in both body styles, for $2,340. Saab celebrates three decades of leadership in turbocharging by launching the 2008 Saab Turbo X, a driver-focused performance car that sets new standards of performance and capability for the brand. The Saab Turbo X has enhanced aerodynamic performance and a distinctive appearance, including specially designed 18-inch alloy wheels that have a grey, titanium-like finish and draw on Saab's classic three-spoke design. The "black turbo" theme is continued in the uniquely equipped interior which includes premium leather. 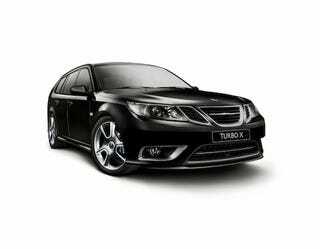 The Turbo X is the ultimate performance expression of the new Saab 9-3 range. It delivers levels of driver involvement and dynamic chassis control never experienced before from Saab. To exploit the full benefits of Saab XWD technology, the chassis of the Turbo X has been lowered 10 mm and the springs and dampers optimized to minimize body movement. To maintain a constant ride height, self-leveling dampers are fitted at the rear. Stopping power is also increased with larger brake discs fitted: internally ventilated, 345 mm-diameter (13.6-inch) at the front; and externally ventilated, 292 mm (11.5-inch) at the rear. Standard 235/45 R18 tires ensure excellent grip for the 18-inch alloy wheels. Developed in Sweden with Haldex of Stockholm, the Saab XWD "Cross Wheel Drive" system is designed to optimize vehicle handling and stability in all driving conditions. It is offered in the 2008 Saab Turbo X and Aero versions of the 9-3 Sport Sedan and SportCombi, in combination with an uprated 280hp, 2.8L V6 turbo which now delivers almost 15% more maximum torque (295 lbs./ft.) to exploit the greater traction available. Engine design features include a lightweight, all-aluminum construction, with a 60-degree angle between the cylinder banks for perfect balance; variable-inlet valve timing and twin-scroll turbocharging. XWD is offered with a choice of six-speed manual or automatic transmissions. The state-of-the-art all-wheel-drive system on the Turbo X includes two innovative features: pre-emptive engagement of the rear wheels to optimize traction at take-off; and an active rear limited-slip differential (eLSD), allowing variable torque transfer between the rear wheels. Saab XWD is a fully automatic, on-demand system capable of sending up to 100 percent of engine torque to the front or rear wheels, whenever necessary. While offering drivers sure-footed handling in low-grip conditions, the system's sophisticated operation also enhances the sporty driving experience in all road conditions. Fine balancing of the drive torque between the front and rear axles raises the threshold at which ESP throttle and braking interventions are triggered, providing more scope for closer driver involvement. At take-off, a torque transfer device (TTD) is initially activated engaging the rear drive module. This pre-emptive function is a valuable improvement over current technology, which requires the detection of wheel slip before the TTD is activated. For the driver, the enhanced functionality gives maximum traction immediately for smooth, strong acceleration from rest without the possibility of any initial hesitation. On the open road, drive torque is seamlessly and continuously varied between the axles by the control of a valve in the TTD. When cornering, Saab XWD rewards the driver by providing enhanced, more finely balanced chassis dynamics through the application of rear drive to balance oversteer and understeer characteristics, improving stability and road holding. In highway cruising conditions, when traction or optimum grip is not an issue, only 5- to 10-percent of engine torque is typically transmitted to the rear wheels providing a greater measure of stability while helping to save fuel. The Turbo X also features an electronically-controlled limited-slip differential (eLSD), which uses inputs from the rear wheel speed sensors and can transfer up to 40 percent of torque between the drive shafts, to whichever wheel has more grip. It represents the first application of an electronically controlled, rear limited-slip differential in the segment. The eLSD also gives the driver enhanced control when cornering hard or completing a high-speed maneuver, such as a lane change, by momentarily applying more or less torque to either of the wheels to help the rear of the car more closely follow the direction of the front wheels. This yaw damping effect can keep the car better balanced and more tightly controlled, without requiring "outside" intervention from electronic stability aides. General Motors of Canada (GMCL) is engineering and manufacturing advanced environmental technologies ranging from Active Fuel Management (cylinder deactivation) and hybrid systems to E85 biofuel and fuel cell vehicles - more than any other auto company right here in Canada. Headquartered in Oshawa Ontario, GMCL employs more than 19,000 people nationwide. GM of Canada manufactures vehicles, vehicle powertrains, and markets the full range of General Motors vehicles and related services through 732 dealerships and retailers across Canada. Vehicles sold through this network include Chevrolet, Buick, Pontiac, GMC, Saturn, Hummer, Saab and Cadillac.